Most people think of camping as roughing it in the food department. Not the case with Camp Chef’s Deluxe Outdoor Oven! 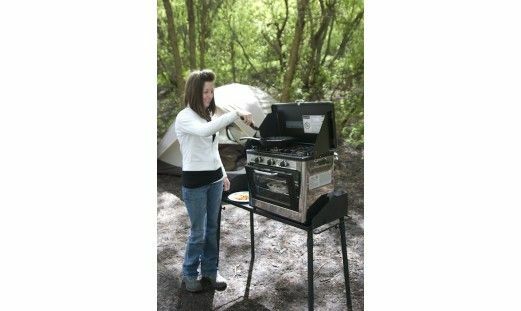 This portable (32 pounds), propane-fueled oven will allow you to make delicious meals from your outdoor campsite. Reaching temperatures up to 400° F, the 2 racks inside will easily fit a 9 x 13 pan. There are 2 burners on the stovetop, and the folding lid provides a convenient, three-sided windscreen. Just think of the happy reactions you’ll get when you pull out those freshly baked chocolate chip cookies for dessert around the campfire!